It looks like the weather might just let us have one more hike near Mount Hood this weekend. 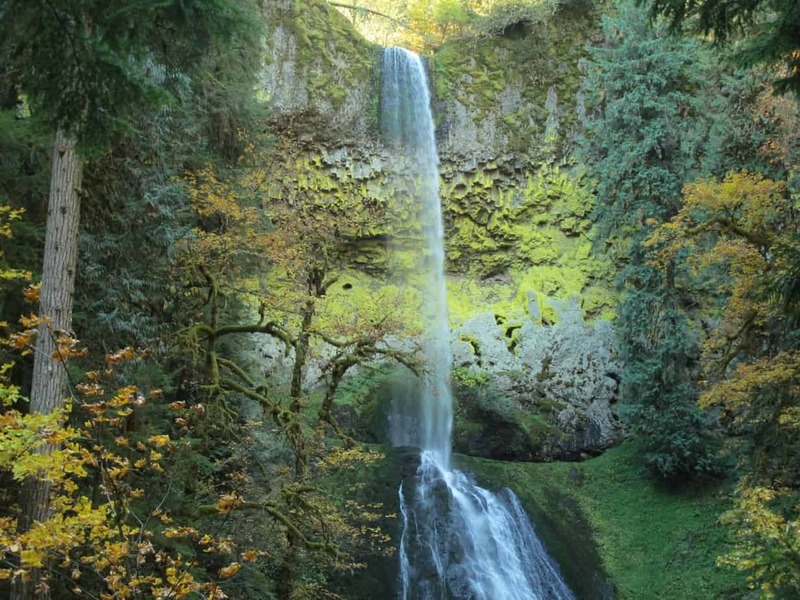 So here’s one for the whole family, an easy stroll to a lovely waterfall with some surprising fall colors. 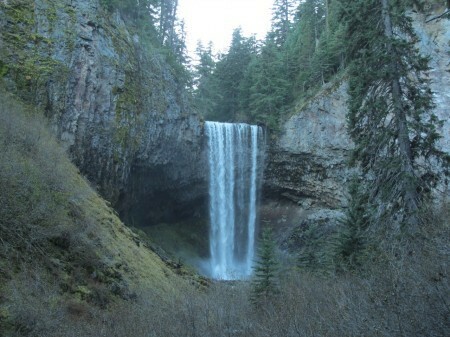 Tamanawas Falls is a beautiful destination at the end of an easy hike. This is a classic falls in a dramatic setting at the end of an easy, beautiful hike that’s perfectly suited for a family outing. 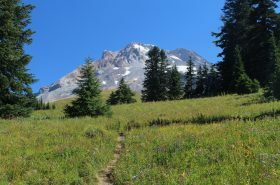 Tamanawas (pronounced “ta-MAH-na-was”) is a Chinook word for a friendly, guardian spirit, and it’s an appropriate name for this nonthreatening, pleasant hike. And the weather forecast for this weekend in Hood River isn’t perfect, but this hike should be right around the snow level on Saturday. Plus, there’s a nice surprise this time of year at the falls. BEST TIME: July–September, or now! There’s some lovely creek scenery along the way to Tamanawas Falls. 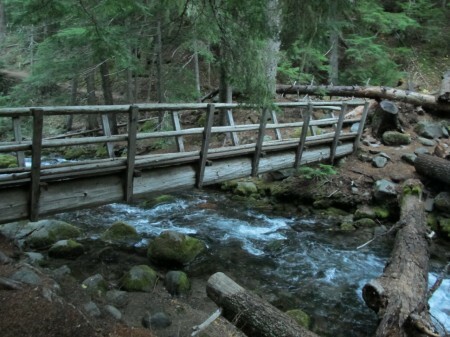 From the trailhead, walk to your right and cross the East Fork of the Hood River on a one-log bridge with handrails. Note the milky color of this river; that’s glacial silt. At the far end of the bridge, join East Fork Trail (650) and follow it to the right, where it parallels the road for half a mile. Ignore the signage on that sign, by the way; you’re 1.6 miles from the falls, not 2. 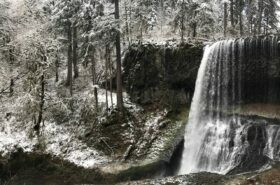 At 0.7 miles, you’ll leave East Fork Trail and cross Cold Spring Creek on 650A, Tamanawas Falls Trail. 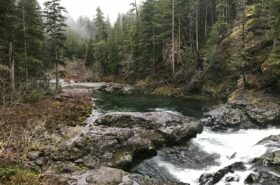 Now enjoy a lovely stretch right along the creek, passing numerous cascades, creekside picnic areas, and forest features, and in 0.7 miles come to a rockslide area where 650B (Tamanawas Tie Trail) splits off to the right. The Tamanawas Falls Trail goes slightly left to cross a rockslide, and from the far side it’s about 0.2 miles to the falls. What makes this falls so special is that even in late summer there’s plenty of water coming over it, and it’s rimmed by basalt walls, much of which are pink because pieces have so recently fallen into the chasm. For this reason, take care if you want to go nearer (or even behind) the falls, as you’ll be walking on wet rocks with no official trail and with cliffs above you—cliffs that provide ample evidence that rocks could come crashing down at any time. These are just little reminders from Mother Nature that we are, after all, just visitors in her world. One other feature to note: A few of the trees around the falls are Western Larches, which you wouldn’t know unless you’re there in late October and they have turned their brilliant shade of gold. Assuming it isn’t raining too hard, it’s a lovely time to visit. 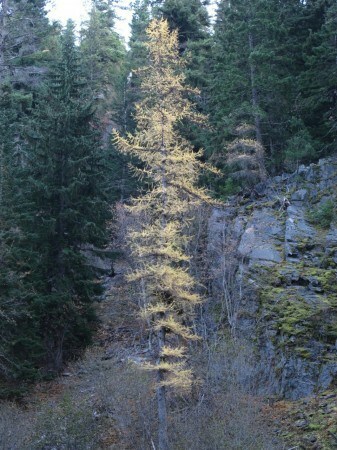 Western Larch near Tamanawas Falls.